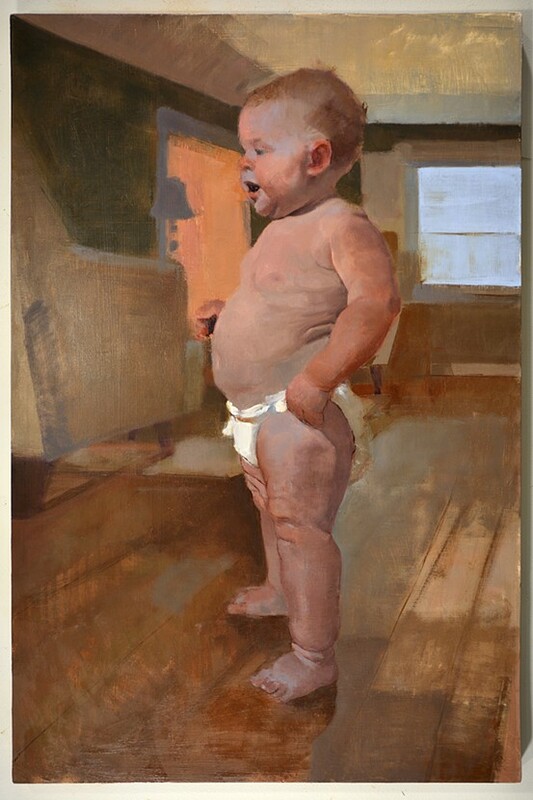 If you look to your left when you walk into Miami University’s cozy Hiestand Gallery, you’ll see “Lucy” (2013), a statuesque portrait of a standing baby. She is turning away from us, pleasurably but implacably following some agenda of her own. She could be a guardian figure at the temple of some distant religion. She fills the canvas to overflowing and in some ways, dominates the gallery space as she has dominated the domestic spaces that Rob Anderson paints. 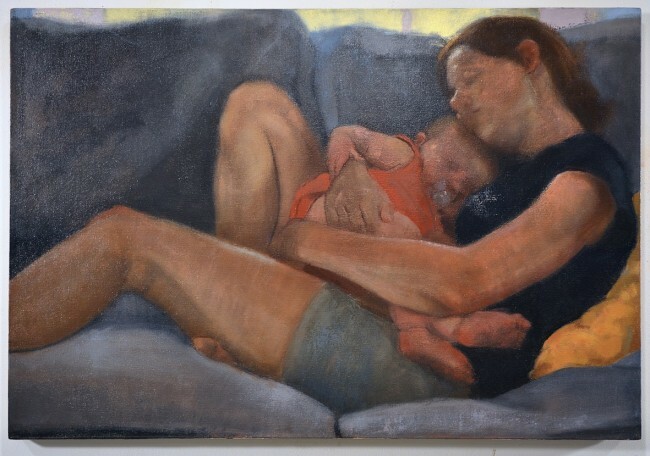 In the more than one dozen canvases in this show, we see her mother by herself, the mother with the child, a solitary male figure, presumably the artist, but we never see two adults together. Truly this is her majesty the baby. 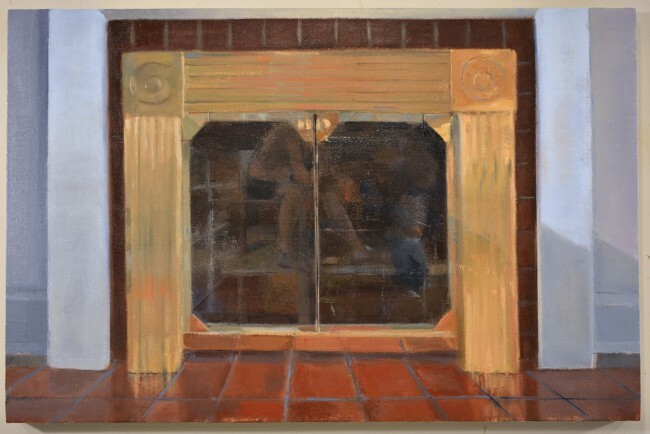 Rob Anderson’s show coincides with his winning the Miami University Young Painters Competition for the $10,000 William and Dorothy Yeck Award for 2013. Though the works in this show are all figurative, Anderson here is not here trying to be the portraitist of the people in his world. To be sure, there are remarkably well-observed details everywhere: the guitar player’s feet, or the way the woman’s face is touched by sunlight. “Mother and Child III” (2013) is perhaps the most “finished” of the paintings. Bodies and faces are fully fleshed out. Elizabeth Nourse wouldn’t be shocked by it. Pictorially, there is no question that this is a woman who is loved. The painter admires her delicate muscularity, her bosom. He seems to have much more mixed feelings about his own body, which he tends to see as more angular, sometimes even grotesque (“Reflections” 2013). When he paints himself, he seems self-conscious (“Thirty” 2013), but her sense of ease always seems natural. Though it’s easy to imagine all the work that could lead to all that sleeping, this is a household that always seems to have time for a nap. Encircled in each other’s arms, mother and child are asleep, though I can’t say if he feels that he is included in or excluded by their intimacy. Whatever else is actually going on in the rooms Anderson paints, the works in this show are partly about cracking the complex code of suburban living. Everything in the house is new and angular; curves are tightly rationed. One wonders what some of the paintings would look like if Anderson had been living in an older place with, say, darker corners, dirtier floors, and banisters smudged with fingerprints. There is only one sketch done outside. The place is not on lockdown—there is evidence that people have been outside—but this particular selection of paintings is relentlessly indoors. There is, apparently, only one truly comfortable piece of furniture, a couch that seems to work better than Ambien for putting people to sleep. In this almost mythic representation of a world, it is always summer. Everyone is wearing jeans or shorts, and no one seems to have to be anywhere in a hurry. There are lots of doorways—these paintings are elegantly filled with framing devices—that open onto barely-furnished, sparklingly-clean rooms. There is a glowing blue square in the background of “Lucy,” but it is a window, not a television; indeed, there are almost no signs of electricity. Though the colors suggest some incandescent lighting, almost all of the paintings have been done in proximity to a window. The house’s functional spaces are hidden away. The couch is for sleeping, but not a bedroom; people are eating, but we never see the kitchen; laundry is being sorted, but there is no washer-drier; paintings have obviously gotten made, but we never see the inside of a studio. 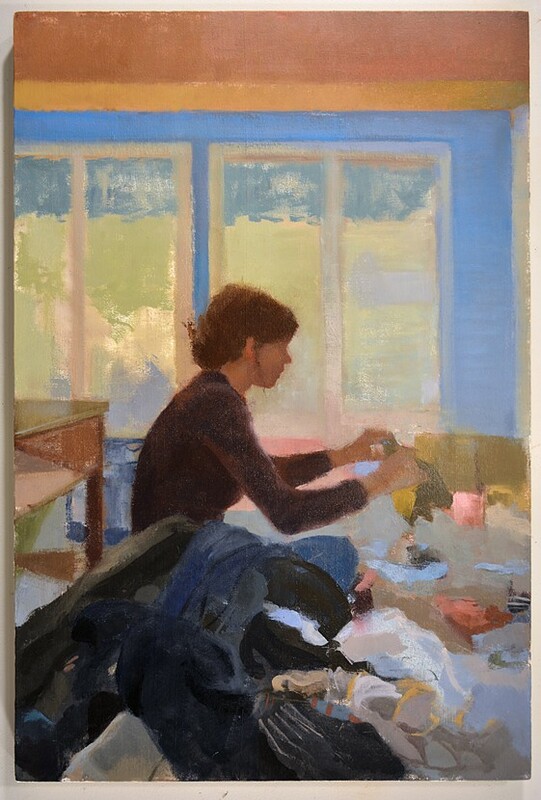 In “Laundry” (2013), the woman—perhaps standing, perhaps sitting on the floor—bends over a pile of things, sorting through them with a combination of delicacy and tight concentration. Once again, the artist seems to be an observer looking in on his own world. Though it is the rare picture of an actual domestic chore, it is hard to resist a formalist reading of it. At the top and on the right, the painting has a rim of stripes that are easier to read as framing devices designed to call attention to the edges of the canvas than as part of the architecture. She is largely backlit with the light coming from a four-paned wall of windows that look like a Japanese screen. As for the laundry, it is really just a tangled mesh of brushstrokes that she is separating and giving form and identity to, one item at a time. One of the most appealing things about Rob Anderson’s paintings is that they have psychological depth without portraying drama or even anecdote. Emotional intensity flows directly from his formal concerns. His world is one where he finds himself drawn to fill rectangles with luscious, painterly abstractions. In a house with tiles, carpets, or planking on every floor and panes of glass on every wall, he has given himself lots to do. 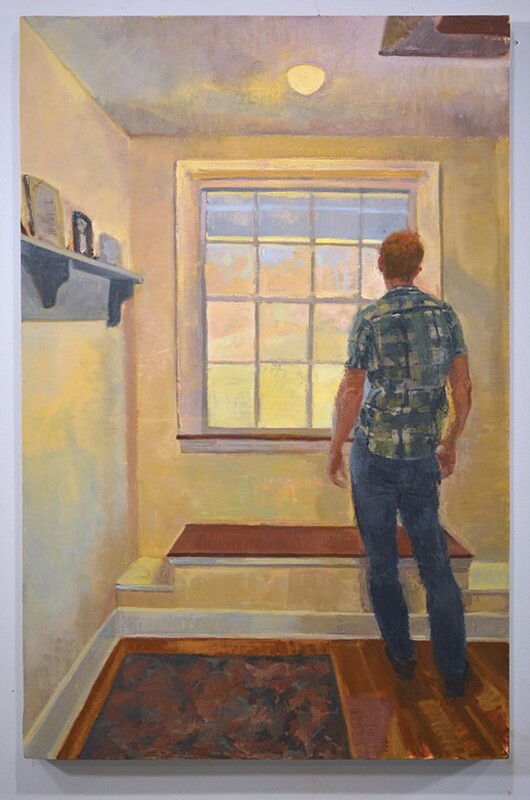 In “Hallway View” (2013), these blank rectangles—even the plaid flannel shirt of the male figure with his back to us—are everywhere, begging to be filled in with sumptuous color and brushstrokes. The presence of a figure keeps the parts from flying free of each other. The man is looking out the window, studying the view as one might study a substantial and well-known work in a museum. He stands in statuesque contrapposto rather than repose and seems a little restless in being turned into the central figure of his own canvas. Having all the comforts of home doesn’t mean that you can’t get a touch of cabin fever, and there is just a little bit of “get me outta here” vying with a lot of “this is the best place to be.” But does he want to go through the window, or to understand the painterly images plainly visible on its glass panes? Everywhere we look in this show, we can see fresh and visually exciting solutions to the classic modernist’s dilemma of dealing with the dimensionality of space and the flatness of canvas. When Anderson’s remarkable windows are not opaque and standing in for an appetite to turn everything into a two-dimensional painting, they are reflective and mysterious. “After a Run” (2013) centers on the twin glass doors in front of a fireplace, a true suburban diptych. The fireplace doors are surrounded by an almost endless sequence of framing squares and rectangles: wall, floor tiles, mantelpiece, brick. There are hints of the receding firebox just visible behind the glass. Reflected in the glass doors, we can make out one, possibly two, barely distinct figures. One is older and sitting, wearing shorts and possibly running shoes. The other—if indeed the other figure is there at all—is a child, running heedlessly but being watched by the parent. 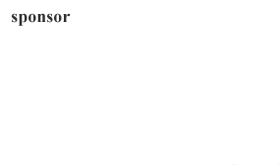 (“After a Run,” indeed—but whose?) They are faint reflections of a space we can’t see. They could be ghosts, or muses, or an oil sketch in its most preliminary stage. In his mundane but magical domestic space, Rob Anderson seems to have found art everywhere, begging to be copied out and made. Love your work — your brushstrokes and colors in particular.